The scene in the Indiana Jones movie Raiders of the lost Ark where an assassin is wielding a very deadly looking scimitar and dramatically displays his prowess with it only to promptly be shot by Indy is a memorable one. This post however is not about that kind of shooting – it’s about portrait photography. I am passionate about floral photography and it’s a subject that fuels my creativity but I find photographing people stressful and nerve wracking. Flowers tend not to object if they don’t look perfect in a shot. My friend Sharon Cohen is a professional portrait photographer and although I’ve seen the striking images she produces I had not seen her in action at a shoot before. I had engaged her services to capture images of my martial arts instructor, Master Seyd Saidi, for a journalistic piece. 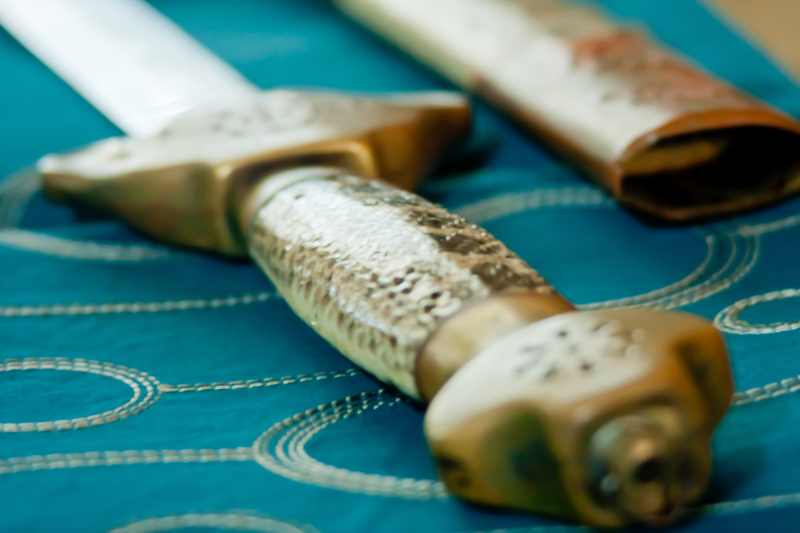 Master Saidi is one of nineteen 6th Dahn Kuk Sool Won Masters in the world and has a remarkable life story. 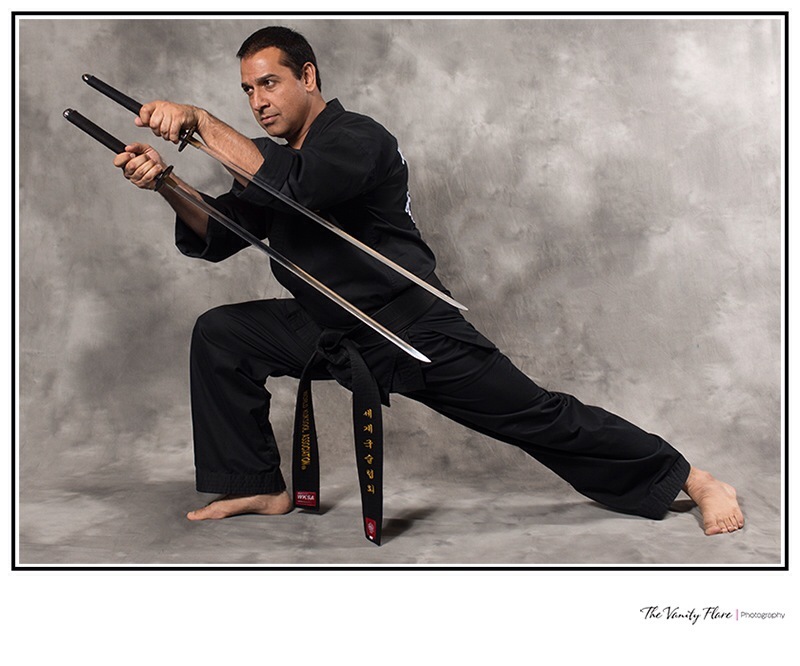 He is passionate about teaching martial arts and has done so for over 25 years. He continues to inspire young martial artists and has a flourishing Kuk Sool Won school based in the Bay Area of California. We arrived at the dojang and I helped Sharon to unload her equipment. It took several trips to do so. The lighting was going to be critical. The training hall has vaulted ceilings with fluorescent lights and since the training area is surrounded by mirrors all sorts of crazy light bounces happen. Sharon took some preparation shots to test the lighting and asked me to pose in front of the backdrop. 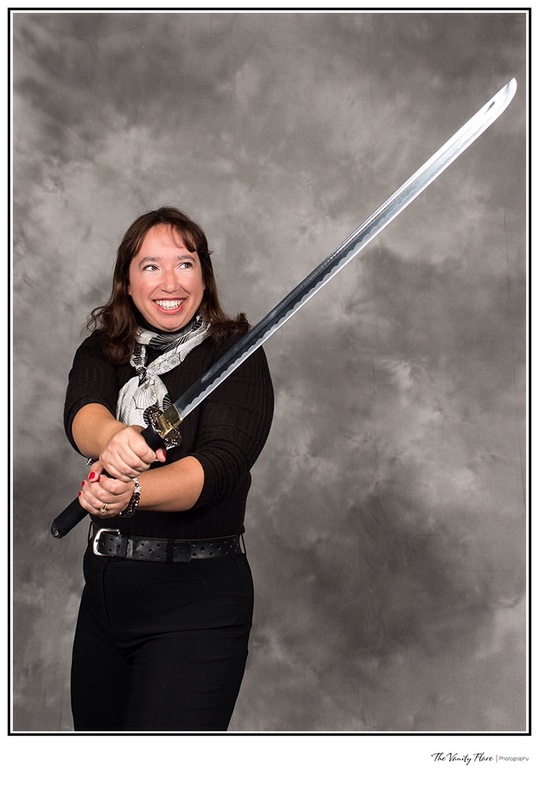 I was not comfortable on the other side of the lens but I had great fun playing with the swords. There was plenty of activity both by the subject and the photographer. Stances were changed, kick height and position were altered while Nikon lenses were swapped and lighting altered and backdrops re-positioned. I had both sword envy and lens envy! Once the shoot was in progress some interesting dialogue occurred that reminded me of Stephen Covey’s book “The 7 habits of Highly Effective People” and the Point of View Paradox with the young and old woman. The example demonstrates how a conditioned mind affects how we perceive things and that two people can look at exactly the same image and see completely different things. Sharon was concerned about capturing his face, eyes and expression sharply with the best lighting and minimal shadows while Master Saidi’s concern was ensuring that the stances, hand and foot positions and angles of the weapons were technically correct. Thank goodness for modern camera technology and previews. They could discuss the captures and decide when a retake was necessary. However since both are highly skilled professionals there were actually very few retakes. This process was a valuable prompt. Since being made aware that my own conditioning also affects my perceptions I do still wonder whether I consciously recognise it often enough when dealing with others. Do you?